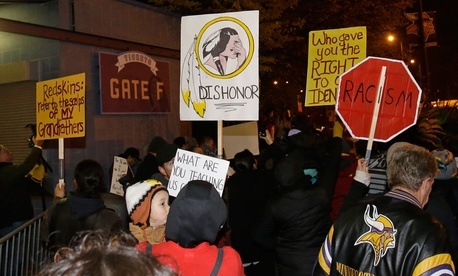 The decades-long controversy over the Washington Redskins' name has hit a climax. On Wednesday morning, the United States Patent and Trademark Office canceled six federal trademark registrations for the team's name and logo, calling the name "disparaging to Native Americans." The office can't stop the team from using the name, but it can (at least pending a court reversal) bar the right to registration protections. This is the second time the office has issued such a judgment. The first time was as part of a case that began in 1992, but that decision was appealed by the team and ultimately overruled by a federal court due in part to a lack of substantial evidence that the name is disparaging. The Redskins organization hasn't yet addressed Wednesday's judgement, but said there will be a statement later today. Team owner Dan Snyder has repeatedly said that he will never change the name. "Daniel Snyder may be the last person to realize this," Senate Majority Leader Harry Reid said on the floor Wednesday after the decision came down, "but it's just a matter of time until he's forced to do the right thing and change the name." There is a huge, contentious history between the Washington Redskins and the United States government. And what the history has shown is that, short of an ironclad government intervention, the Redskins aren't likely to change anything. That's what happened in the early 1960s, when the Redskins were the last racially segregated pro football team in America. Even though Washington was a majority black city by 1960, the team's then-owner, George Preston Marshall, refused to desegregate his team. His team was the team of the South, and he believed he benefited from keeping the team all white. What finally pushed him over the edge was John F. Kennedy's administration. As detailed in Thomas G. Smith's Showdown: JFK and the Integration of the Washington Redskins, the team was planning to move in 1961 to a stadium built on federal land. Kennedy's Interior secretary, Stewart Udall (father of Sen. Tom Udall, uncle of Sen. Mark Udall), gave the team an ultimatum: Desegregate or lose the stadium. On March, 24, 1961, Udall told Marshall that his department had approved regulations barring job discrimination by anyone who wants to use "any public facility in a park area." At a news conference later that day, Udall said of Marshall that "I think it is quite plain that if he wants an argument, he is going to have a moral argument with the president and with the administration." After initial anger and push-back from Marshall, the plan worked. By late May, Marshall said that he'd go by the law even if it meant putting "Eskimos or Chinese or Mongolians" on his team. Udall gave Marshall a little wiggle room, allowing the team to stand segregated until the 1962 season, after the December 1961 draft. At that draft, Marshall drafted multiple black players, eventually trading one of those picks for Bobby Mitchell, a black who would later be inducted into the Hall of Fame. Udal later wrote that he moved against the team because of his "personal convictions about civil rights" and because he "considered it outrageous that the Redskins were the last team in the NFL to have a lily-white policy." Udall didn't go over the plan with JFK ahead of time, but felt that JFK would agree with it on principle. It's not just the U.S. Patent Office acting. Multiple congressional leaders, including Reid, have been pushing the Redskins to change their name for months now. History shows that government action to force the team's hand can work.